When you say that "church bells have rung for centuries" you are not speaking the truth. Bells have rung in Syria and Iraq for not much more than a hundred years, at most. A nakos (gong) outside St. James Church in Jerusalem. 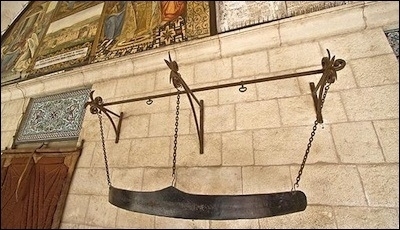 As determined by Islamic law, church bells did not sound throughout the middle East for more than a thousand years from the 7th century conquests until modern times (except under the Crusaders). This was due to the conditions set by the Pact of the Caliph Umar, by which Christians of Syria surrendered to Islamic conquest in the 7th century AD. In this pact the Christians agreed that "We will not sound the bells in our churches." Churches in regions controlled by Muslims used semantrons (also called nakos) instead of the forbidden church bells. Examples of these are still visible in Jerusalem to this day, e.g. see here. The silence of church bells for more than a thousand years across the Middle East bears witness to the conquest and long-standing suppression of Christian societies under Islamic rule. Recent genocidal attacks on Christians by ISIL are sadly but the end-stage of a long series of abuses. Mark Durie, the pastor of an Anglican church and founder of the Institute for Spiritual Awareness, is a Shillman-Ginsburg Fellow at the Middle East Forum.